I have once again returned to the road, exploring the great US of A. And what better way to explore a city then by checking out a game store? This week I am in St Louis, MO and my lord and master Google led me to Game Nite. Game Nite presents an unassuming front with a small sign and some window decorations, but the inside holds a veritable treasure trove of non-electronic gaming! Upon walking in I was greeted by the cashier and saw a massive gaming area that took half of the floor space. But, thanks to their clever use of space it did not feel as though it significantly reduced the amount of shopping area. Connecting the play area is a grand selection of card protectors and dice which lead you to a plethora of minatures, cards, boardgames, and RPG books. I honestly can't say I have ever seen a larger collection of Dr. Who RPG source books and Star Wars Armada models in one room. If you ever find yourself in St. Louis look them up. 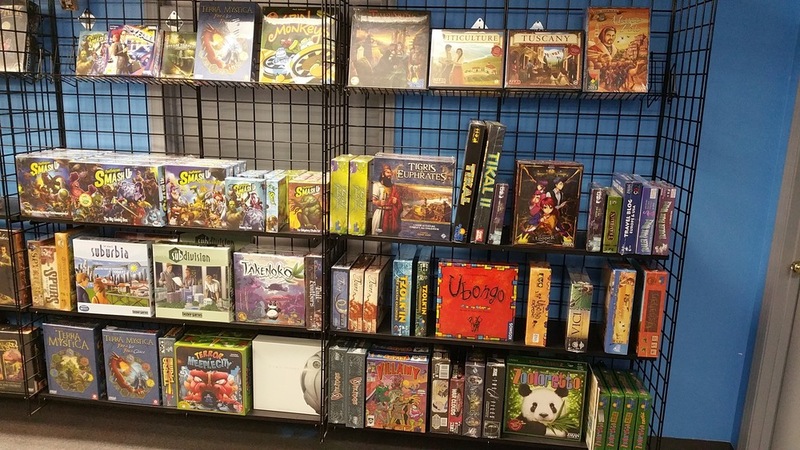 Game Nite will have something you are looking for. Being on the road again has also given me some some to time to catch up on missed anime. A such I have started binging Amagi Brilliant Park on CruncyRoll. The premise of this show is that all theme parks are actually run by the denzians of magical lands. These parks take the joy and happiness from their guests and crystallize it to survive. Amagi Brilliant Park is one such park, but it is on the brink of failure. Should it fail the fairy folk that live there will lose their will to live and may die. This brings us to episode one. Our main protagonist has 3 months to get 250,000 guests. This is the same number of guests they have received the previous 9 months. He has his work cut out for him. Thus far I am really enjoying the show. It is fun to watch and I am looking forward to the continued character development. There are 13 episodes in total and CrunchyRoll has 12. I highly advise checking out this show. And that is really all I have done as far as geek stuffs go this week. Looking forward to talking to you all next week!